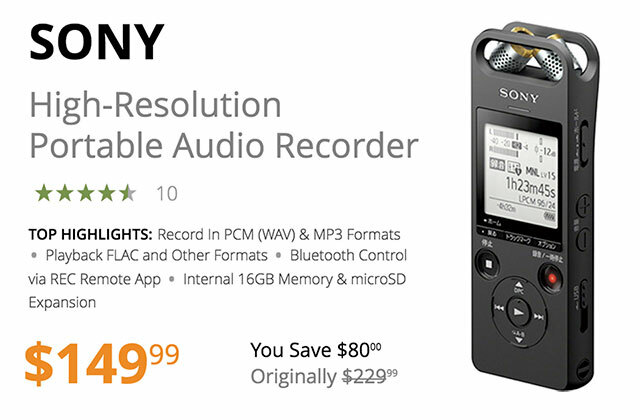 The recorder has two adjustable microphones, allowing you to capture stereo recordings in a variety of placements. Three settings include Zoom (for situations including business meetings), XY (for things like band rehearsals), and Wide Stereo (for recording outdoors). 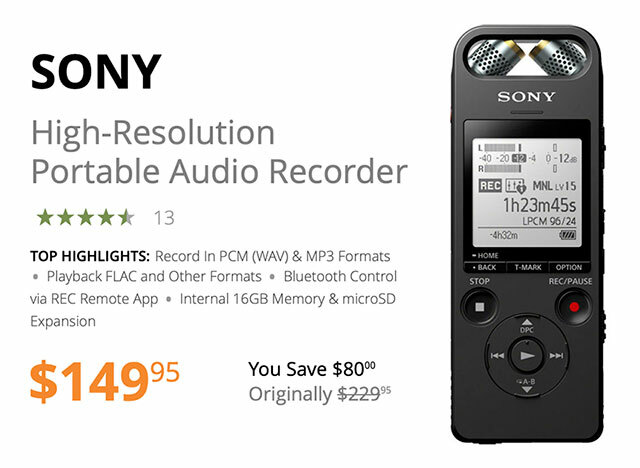 You can adjust the sensitivity of the microphones in a variety of different ways, and set the device to record only when it hears noise above a certain level; in such a manner, the recorder can be voice-activated. The ICD-SX2000 can record in WAV or MP3 formats, and can play many different kinds of filesâ€”it even sports FLAC playback support. You can play audio through the unit’s built-in speaker or over headphones. You can also plug a microphone into its 3.5mm input jack. To eliminate the need for cables, the device sports a retractable USB plug, which you can use to plug directly into computers. A stereo mini-jack output with monitor volume control is included and both stereo mini and stereo XLR cables are provided. The unit also includes a headphone monitor output for use with cameras and camcorders that don’t have a monitor output. An LCD display provides channel and frequency information, battery life, RF-input level, audio-output status and accumulated operating time. For power, the receiver operates on two AA batteries for up to 6 hours, or on 5 VDC of USB power over a USB micro B cable. The USB connection can also be used to recharge Ni-MH rechargeable batteries within the battery cartridge. The receiver’s compact design and included shoe-mount adapter allows easy mounting to most camcorders and interchangeable lens system cameras. 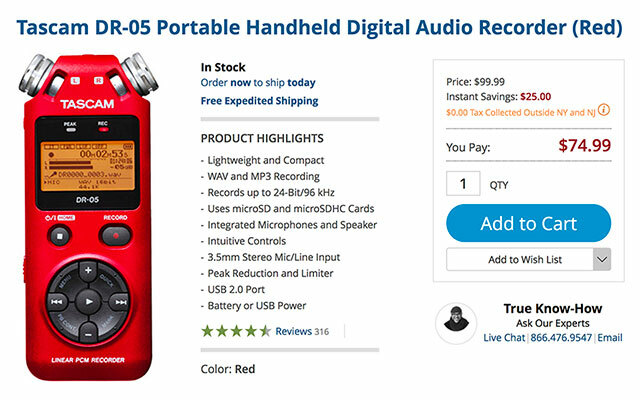 Tascam DR-05 Handheld Digital Audio Recorder (Order Here) offers high-quality recording in a lightweight and compact design that anyone can use, and is perfect for musicians, teachers, journalists, and more. The DR-05 records WAV or MP3 files at rates up to 24-bit/96 kHz to microSD or microSDHC cards for reliable, skip-free storage. A 2GB card is included so you can get started right away. 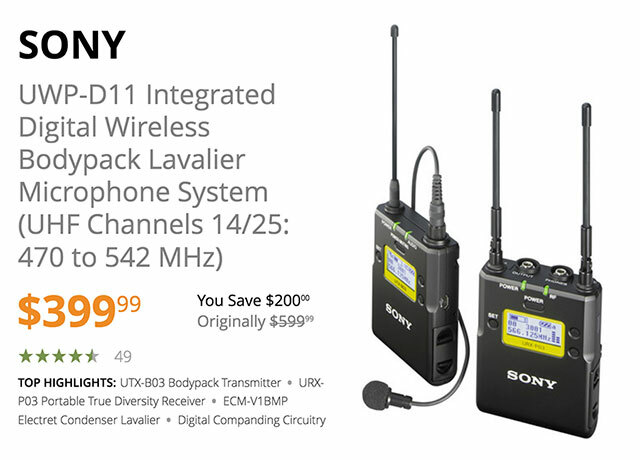 Integrated microphones capture clear stereo audio, while a 3.5mm stereo mic/line input lets you connect external mics and sound sources. The jack even provides plug-in power for mics that require it. An integrated speaker and a 3.5mm headphone jack make it easy to listen to your recordings to make sure everything was captured perfectly. Large display screen shows vital information during recording and playback. Intuitive controls provide quick and easy single-handed operation. The Peak Reduction feature will automatically set your recording level by listening to the audio input and adjusting for the best level. When used alongside the built-in limiter, unwanted distortion becomes a thing of the past. The DR-05 includes other classic Tascam features, such as Variable Speed Audition, a level-align function, loop and repeat playback, self-timer recording, integrated editing, a chromatic tuner, and more. USB 2.0 port allows you to connect the recorder to a computer to quickly transfer files. The DR-05 operates on a pair of standard AA batteries or via the included USB cable. A threaded socket provides convenient tripod mounting. 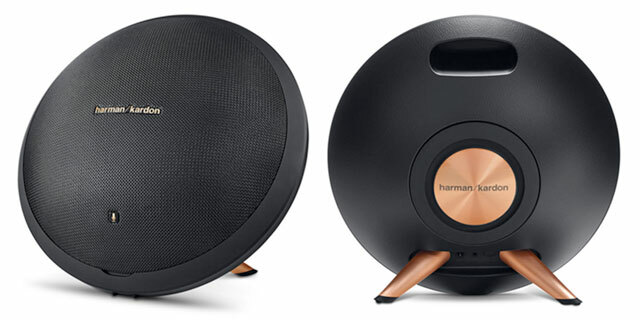 SAVE $290 on Harman Kardon Onyx Studio 2 Wireless Speaker – Just $149 after Instant Savings! Here’s the perfect portable speaker for any location shoot! Stream high-quality audio from all your compatible home and mobile devices. It’s equipped with four driversâ€”two 3″ woofers and two 0.75″ tweetersâ€”and two passive bass radiators that are designed to deliver an enhanced sound experience.